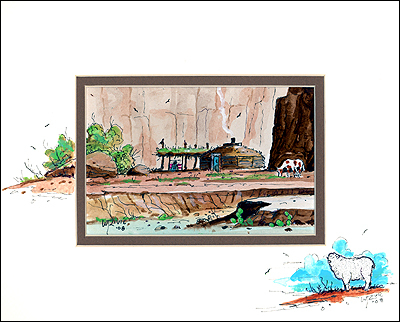 A hogan dwelling sits deep in a canyon as a weaver works her loom. Navajo textiles are highly regarded and have been sought after as trade items for over 150 years. The Navajo-Churro sheep shown in the corner of the mat is the source of the wool used in the creation of Navajo rugs.